If you'd like to skip right to the Rene Caisse and Essiac film, scroll to the bottom for the video. If you'd like to read about the history first, here it is! According to many herbalists and in the marketplace today, "Essiac" is comprised of four herbs: Sheep Sorrel, Burdock Root, Slippery Elm Bark, and Turkish Rhubarb Root. The recipe is not trademarked, and almost every herbalist carries it. However, this four herb formula is a smaller version of the eight herb formula originally received and gradually refined by Canadian nurse Rene Caisse. The story of "Essiac" is depicted in the Rene Caisse and Essiac film. 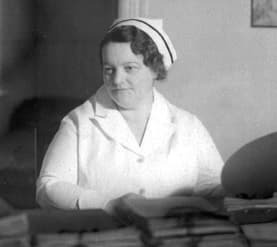 This story began decades ago when Caisse heard of an herbal recipe from an elderly female patient who was in an Ontario hospital where she was the head nurse. The recipe contained eight herbs, and was given to the woman years before by an Ojibway medicine man. He had offered his help because he knew the woman was suffering from breast cancer. The patient recovered from her cancer and saw no return during the span of the next 30 years. In 1922, she gave Rene the recipe after Rene expressed her interest in attempting helping others with cancer by administering this herbal formula. Rene Caisse used this original eight herb recipe two years later on her aunt, who was terminally ill with stomach and liver cancer. She eventually started calling it eight herb essiac (essiac coming from her last name spelled backwards). Her aunt recovered and lived another 21 years, meaning that she died only of old age. Rene and her aunt's doctor began experimenting with the herbal tea and research began on mice. The doctor, Dr. R.O. Fisher, began using it on his terminally ill patients, and some improved greatly. Rene and the doctor began to vary the formula. They injected one herb (Sheep Sorrel) and administered the others orally. The Ojibway medicine man and his people never injected it; they had simply prepared tea, but Rene had decided to conduct formal research on her formula in hopes that she could improve it's efficacy. It was discovered that only one herb could be injected--and only into the muscle. This was a painful procedure for very sick people, and many, due to their emaciated state, had hardly any muscles left for the injections. Nonetheless, this partial-injection method was used for some years and there were some successes that were documented in stories about this formula. However, there were failures too, as many sufferers were so far gone, they had little time left. In others, the disease had damaged vital organs beyond repair. For further details, please watch the Rene Caisse and Essiac film. The eight herb essiac formula varied slightly over the years from the original essiac that the woman received from the medicine man in 1892. In fact, there are some variations of the eight herb formula today. These changes happened as part of a natural testing process whereby patients were monitored and their results observed. In 1959, Rene Caisse went to the Brusch Medical Clinic in Cambridge, Mass. to join Dr. Charles Armao Brusch, MD. She became partners with Dr. Charles Brusch with the intent of forming the "Rene Caisse Cancer Research Foundation," a charitable foundation which would have the purpose of utilizing this treatment for cancer in humans. Rene was provided with rooms for her use at the clinic and all her expenses were taken care of. Rene and Charles Brusch remained partners, co-developers and co-owners until her death in 1978 at the age of 91. Dr. Brusch, President Kennedy's physician, had developed an interest in other natural forms of healing--his objective always the 'well-being' of the patient. He had set up the first acupuncture clinic to collect research data, and it was operating in his medical clinic when Rene Caisse arrived in 1959. He was the first doctor in the Western hemisphere to initiate a plan similar to Medicare within his clinic for those without money for medical help. He was extremely interested in herbs and their power to heal, which he learned from a long-time friend, a master herbalist from Lathrop, Missouri. The objective at Dr. Brusch's clinic was to prove the merits of this simple, non-toxic, herbal formula called eight herb essiac. The formula had been used with great success on so many terminally ill patients but Dr. Brusch wanted to do even better. They began their research on the eight herb essiac using oral treatment only. No other medication was used and the herbs were given on an empty stomach. In the hope of identifying the active ingredient, they experimented with variations of injectable solutions, each vial containing a different herb. This failed to isolate one single herb, proving that effective results are obtained synergistically though the unique combination of the eight herbs in the correct proportions. Consequently they returned to using the eight herb essiac formula administered in an oral fashion. Check out the Rene Caisse and Essiac film for further understanding of this fascinating story. Learn why in the Rene Caisse and Essiac film. 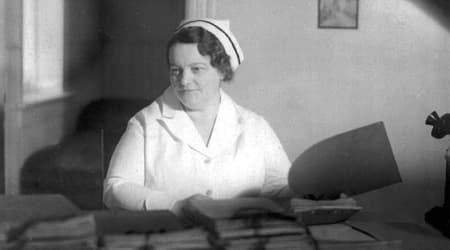 A rare glimpse of the humble Canadian nurse who helped spread "Essiac" to the world in the 1920's. Filmed in the 70's. Click here for our most popular order size: the six month supply in THIRTEEN (13) 4 oz. sealed packets of essiac herbs.